The White House has dismissed as "absurd" allegations made in a BBC TV series that President Bush claimed God told him to invade Iraq. "He's never made such comments," White House spokesman Scott McClellan said. The comments were attributed to Mr Bush by the Palestinian negotiator Nabil Shaath in the upcoming TV series Elusive Peace: Israel and the Arabs. 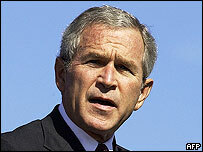 Mr Shaath said that in a 2003 meeting with Mr Bush, the US president said he was "driven with a mission from God". "President Bush said to all of us: 'I'm driven with a mission from God. God would tell me, George, go and fight those terrorists in Afghanistan. And I did, and then God would tell me, George, go and end the tyranny in Iraq... And I did. "'And now, again, I feel God's words coming to me, Go get the Palestinians their state and get the Israelis their security, and get peace in the Middle East. And by God I'm gonna do it.'" Palestinian leader Mahmoud Abbas, who attended the meeting in June 2003 too, also appears on the documentary series to recount how Mr Bush told him: "I have a moral and religious obligation. So I will get you a Palestinian state." The TV series charts recent attempts to bring peace to the Middle East, from former US President Bill Clinton's peace talks in 1999-2000 to Israel's withdrawal from the Gaza Strip this year. It seeks to uncover what happened behind closed doors by speaking to presidents and prime ministers, along with their generals and ministers. The BBC Two series, Israel and the Arabs: Elusive Peace will be broadcast on Mondays from 10 October at 2100 BST.